I was born in 1951 in Bandung, West Java, Indonesia, but grew up in Yogyakarta, where the arts have been highly appreciated for thousands of years. Since childhood I have really enjoyed wayang kulit (shadow puppet theater), a traditional Javanese art form in which various characters are crafted out of leather, mounted on bamboo sticks, held up behind a white cloth, and backlit. During primary school I would sometimes make wayang from thick paper, paint them, and sell them to my friends. I studied architecture for one year at Gadjah Mada University, the oldest and one of the most prestigious universities in Indonesia. This is where I learned the basic principles of visual composition. After that I decided to learn independently and from senior artists in Yogyakarta. I now enjoy painting in my own style. I still live in Yogyakarta but frequently visit Bali, where my daughter and grandchildren live. Most of my paintings are inspired by nature or by stories from the Bible. In the 1970s and ’80s I painted batik, which are cloth works made using a wax-resist dyeing method. In the 1990s and 2000s I switched to oil painting because of government regulations that restricted the use of certain colors and materials due to a supply shortage. Today I continue to paint with oil as well as acrylic. I’m interested in exploring how humans relate to their inner spirits and to their Creator, God, whether that be through nature, religion, politics, or their surrounding environment. 1. Gunungan, 2013. Oil on canvas, 40 × 30 cm. In Javanese puppet theater the Gunungan puppet always marks the beginning and ending of the show, as well as the beginning of each new scene. 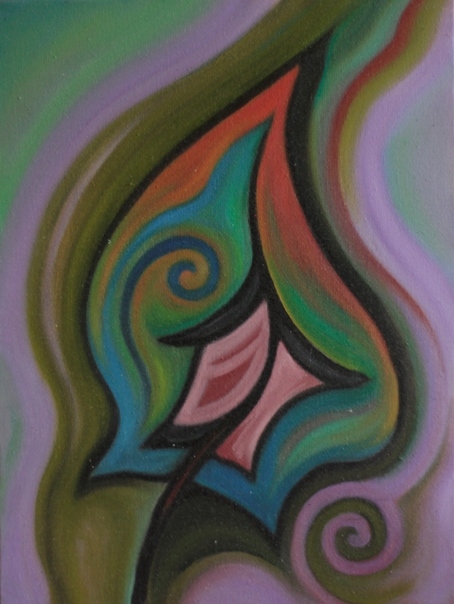 This abstract painting suggests to the viewer that everything has its start and its end. 2. Menanti (Waiting), 2014. 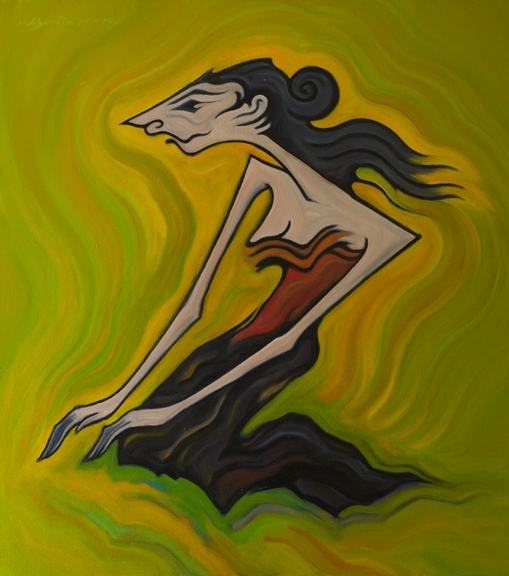 Oil on canvas, 90 × 80 cm. A Javanese woman, whose appearance is inspired by a shadow puppet, patiently waits for the return of her partner. Patience and faithfulness are two characteristics that the perfect Javanese woman (wanito utomo) must possess. 3. Magnificat, 2012. 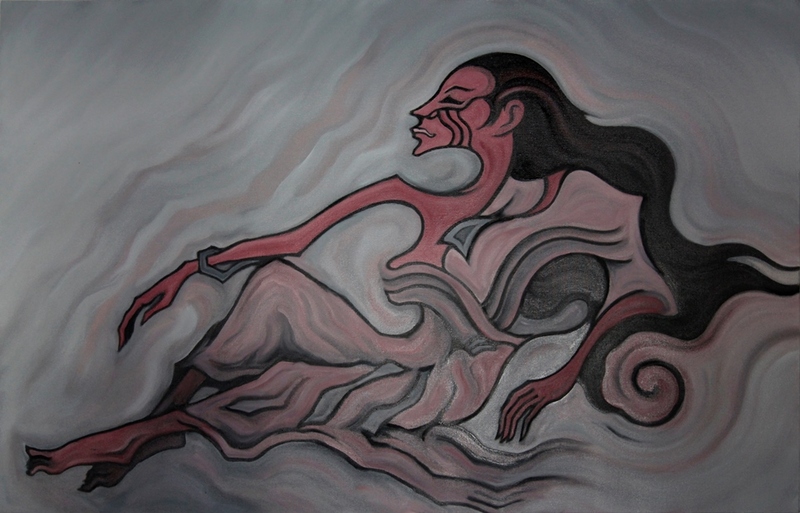 Oil on canvas, 90 × 60 cm. Mary prays that peace will come to the world through the Christ Child in her womb. God responds to her by cupping her in his hand so that she will not fall into the dark, chaotic underworld. 4. Dosa Pertama (The First Sin), 2004. Oil on canvas, 100 × 100 cm. 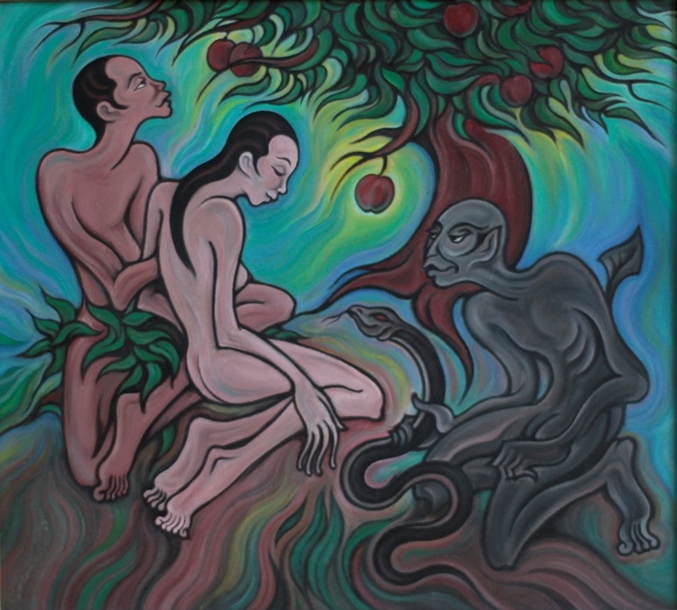 In the Garden of Eden Satan tries to tempt Adam and Eve to eat the forbidden fruit. 5. Wanita Mulia (A Noble Woman), 2015. 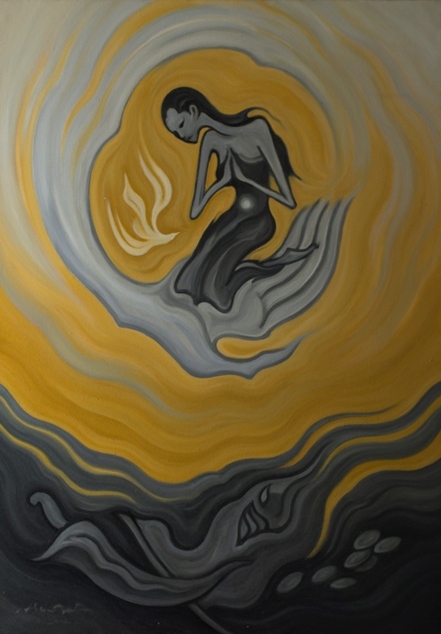 Oil on canvas, 100 × 150 cm. Most of my exhibitions have been organized by Christian universities in Yogyakarta, and out of these have come papers by theologians and other researchers. See here and here. Katajun Amirpur and Wolfram Weiβe, eds., “Religionen, Dialog, Gesellschaft: Analysen zur gegenwärtigen Situation und Impulse für eine dialogische Theologie” (Münster: Waxmann, 2015). Volker Küster and Robert Setio, eds., “Muslim Christian Relations Observed: Comparative Studies from Indonesia and the Netherlands” (Leipzig: Evangelische Verlagsanstalt, 2014). Femke Visser, “Zending in de religieus plurale context van Indonesië: Een verkennend en vergelijkend onderzoek naar de contextuele theologie van: J.B. Banawiratma, E.G. Singgih, S.E. Lakawa” (master’s thesis, Utrecht University, 2013). “The Christian Art Scene in Yogyakarta, Indonesia,” Indigenous Jesus, July 16, 2012. Karel Steenbrink, “Christian Artists in Yogyakarta,” Relindonesia, July 15, 2012.